Japan, come on now. Stop it! You don’t need to offer those gracious bows.Or your incessantly impressive food with simply stunning presentation. You don’t need to lure me with seven varieties of breakfast rolls, or 4 kinds of salt or the myriad of ways in which you offer health to every meal–with fish or seaweed or pickles or miso. There’s no need for the delectable Kobe sweets or even its orgasmic beef–although that is a meal that I never, ever want to forget. Truly, Japan, you had me a Toilet; and that was while I was in the air over my own country; before I discovered your in-country toilets. 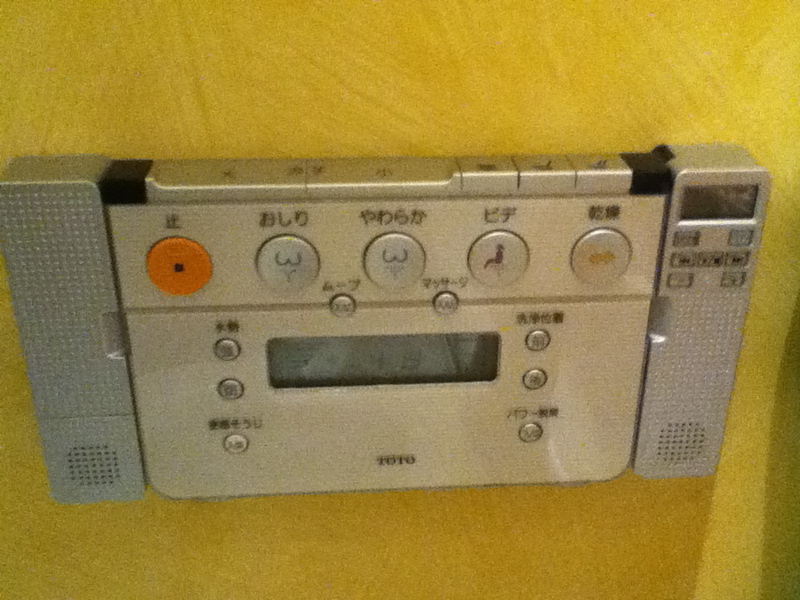 For the restroom in JAL’s 787 flight from Boston to Tokyo was a surprise. Streamlined. Crisp. High functioning. You gave limited space a feeling of spaciousness and even understood the sublime relevance of place on the counter for a folded paper flower in the morning after 11 hours in the air. But it was when I arrived in the airport in Tokyo that my world view was shifted. There, I encountered my first toilet– with a control panel of choices (which I was afraid to use until the comfort of my own hotel); and I was hooked–line & sinker. No matter where I encountered your toilets, even your terribly frightening traditional ones on the floor, there was always one feature upon which I could rely: Privacy. Floor to ceiling doors enclosed each toilet space for that most intimate of needs. Sometimes, even a tiny sink was included. I’m sorry, but it just isn’t enough to list Toilets at the top of the 10 Things I’ll Miss Most About Japan, I have to elaborate, even if my friends have grown tired of my gushing. I will restrain myself from talking about anything beyond the toilets–like the round ball that served as the most perfect and easy to use tub stopper that I have ever encountered.Or the slot inside the door of my hotel room, where the key card is placed, which results in the lights and the air condition turning on–or off, when you depart. 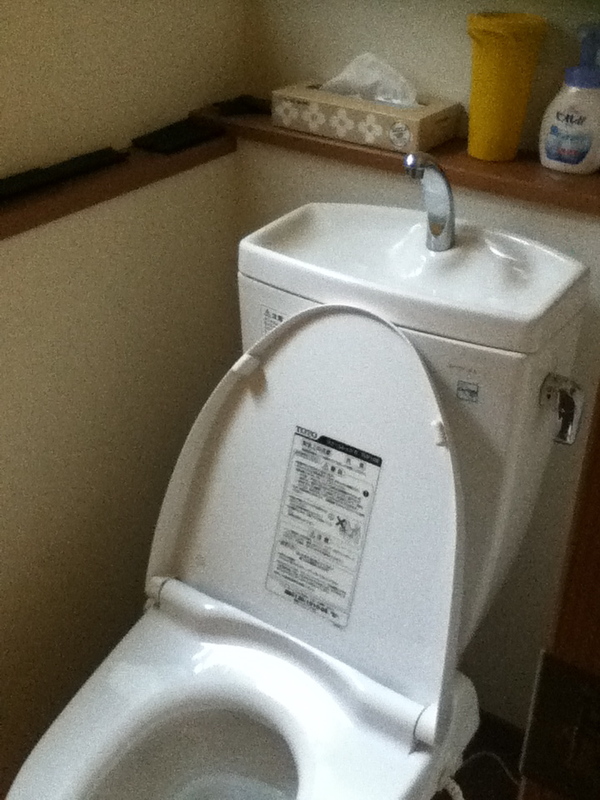 Or the tiny apartment where I stayed in Kyoto, where the faucet for the sink pivoted to serve as faucet for the bath; or the toilet which had a sink built into it–where hands were washed before the water traveled into the tank for flushing. Space & resource efficient sink/toilet combo. Kyoto apartment. The truth is that I don’t typically get excited about mechanics and technology, but you hit me where it counts–in the place where we all crave comfort and privacy and efficiency. Before you, I never gave much thought to restrooms. I never compared one country to another over it. I certainly never fell in love with a place because of it. But like a lovesick teenager, I can’t sing enough of your praises. My resident therapist (aka. my husband) suspects that years of toileting trauma at the hands of my grandmother may have been healed in my two week visit to your country. …And what about the fold-out shelves? A clean place to put your things, like backpacks or shopping bags, instead of on the floor? 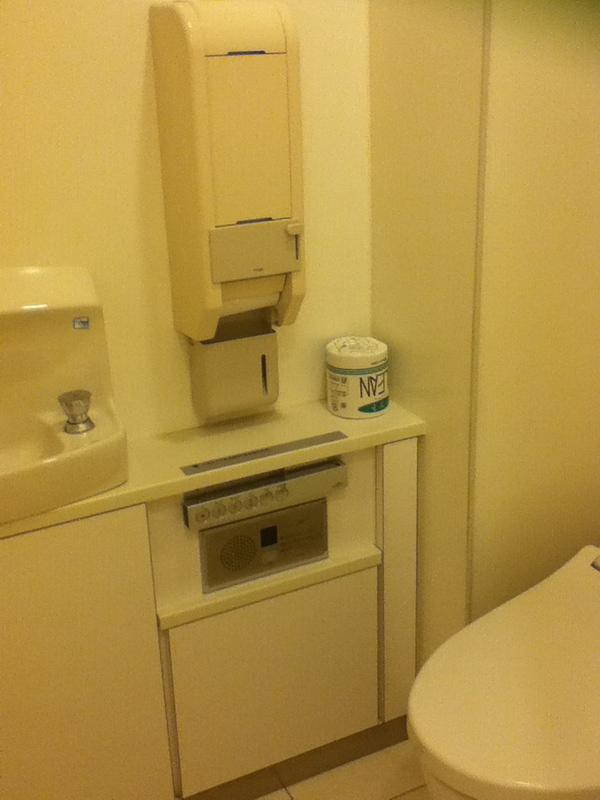 Seriously, Japan, set aside your stunning temples and shrines, you had us at Toilet. ps. One question though. What was this contraption for? pps. 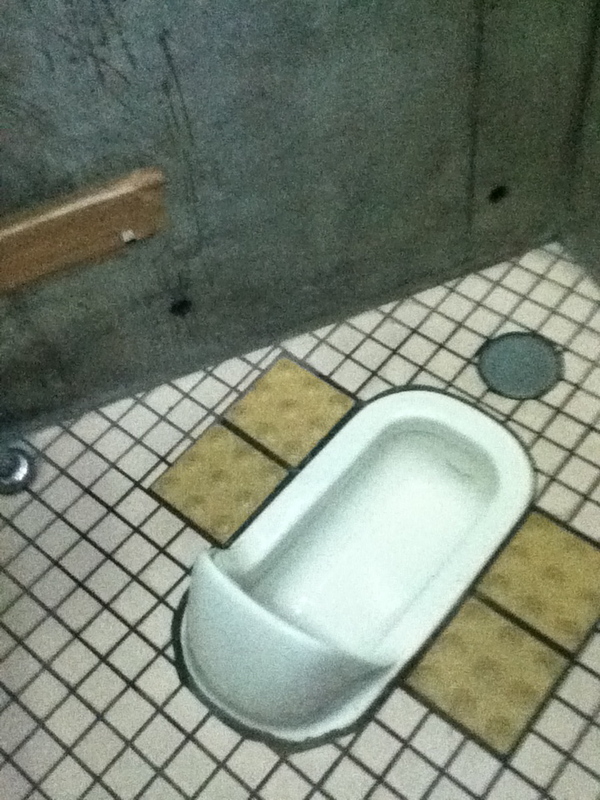 For those who are wondering, here’s a photo of the traditional toilet, still apparently preferred by many (Japanese) women–of all ages. Practice those squats ladies! Some of these don’t come with balance bars. Your article had me giggling with recognition. I sent it to family in an attempt to help them understand my fascination with the place. I even cried on the plane home from Japan, thinking, “WHY am I going back to the US? WHAT am I doing?”. The food, the people, the obvious thought that goes into so many things…and the toilets that we quickly become used to! 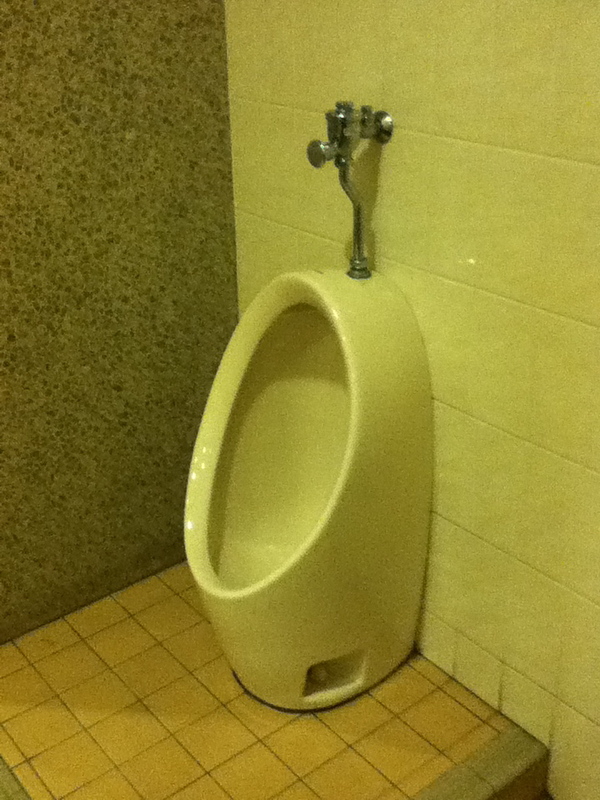 I believe the photo of the contraption in question depicts a urinal for a small boy to use. 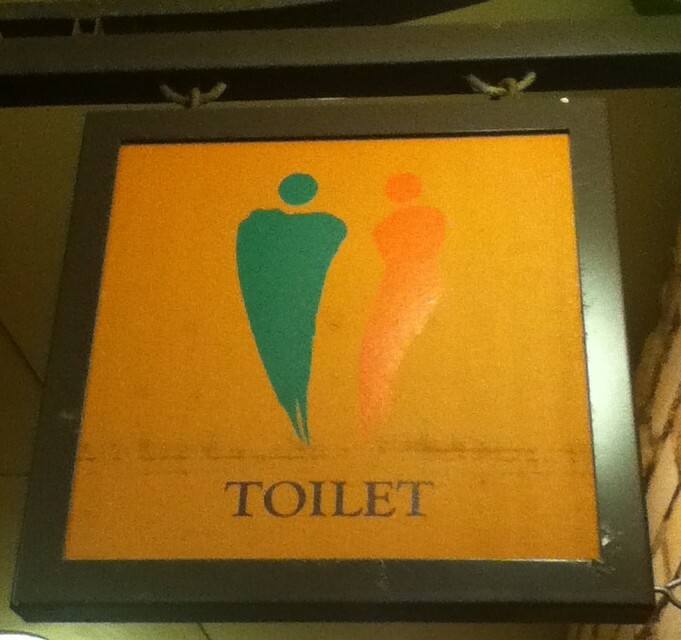 I saw them installed in a ladies room in a grocery store with one of those perfect pictograms that explains everything in the universal language of images. My friend who lives there seemed surprised that I was so impressed that a women’s restroom would even have such a thing.